This set is focused on energizing and keeping a balancing body when you wake up to start your day running. 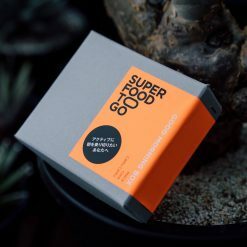 Good Morning Superfoods To Go contain chia seeds, maca powder and camu-camu powder which are made from organic Peruvian and Argentinean produce. 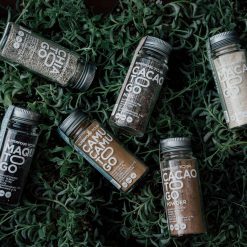 Maca roots originate from the harsh environment of the Andes mountains as far back as 2000 years ago. Historically, it has been used as a tonic and a superfood. Maca is an extremely popular superfood that is called the “perfect food” because of its high nutritional content. It is particularly popular amongst women to help deal with hormone imbalances and female-specific problems. Maca root contains contains 20 types of amino acids and 7 essential amino acids. Chia seeds (Salvia hispanica) are a species of flowering plant in Lamiaceae. Its health benefits were first discovered during the Mayan and Aztec era. The high omega-3 fatty acid content keeps your skin firm and glowing. 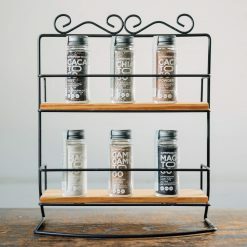 Not only do chia Seeds contain omega-3 fatty acids, but also high quality protein, fiber, calcium, iron, and magnesium. Recognizing this, chia Seeds are known as one of the most balanced nutritious super foods. Furthermore organic camu-camu berries contain 60 times more vitamin C than lemon and 2 times more than acerola. Vitamin C has numerous health benefits, including improved skin health and digestive function. What’s more is that camu-camu berries also contain polyphenols. These berries have been used worldwide, especially by Amazonian tribes who knew about its rich nutritional profile and used it daily. This set is focused on energizing and keeping a balancing body when you wake up to start your day running.